In Mellingen, thirty minutes northwest of Zurich, empty apartments offer a warning sign about the fallout of negative interest rates. The financial sector has long complained below-zero rates hurt profitability, and surveys show a growing percentage of bankers say buy-to-let properties are becoming a risk. 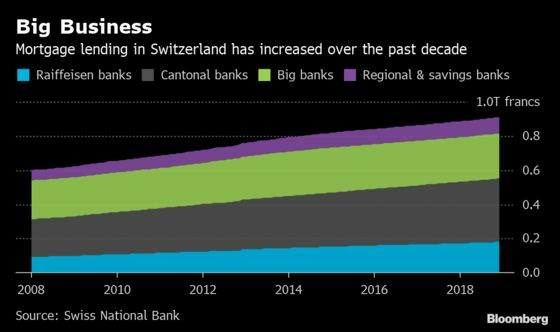 Despite the concerns, the Swiss National Bank isn’t rushing to raise its deposit rate. President Thomas Jordan says it’s kept deflationary pressures at bay and is “essential” for keeping appreciation pressure off the franc. The currency is still stronger than the 1.20-per-euro level at which the SNB once set its minimum exchange rate. The central bank is expected to leave policy unchanged at its decision on Thursday, and economists polled by Bloomberg see no move from minus 0.75 percent until early 2021. Negative rates aren’t just controversial in Switzerland. At the European Central Bank, some fret they’re doing more damage than good. 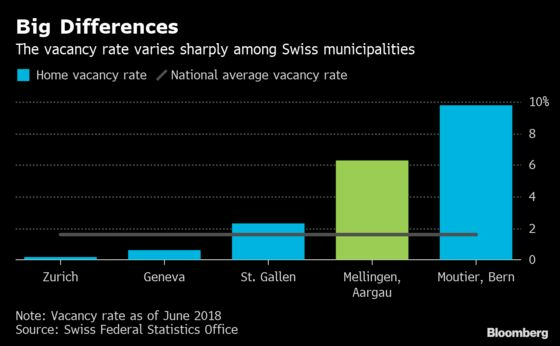 In Switzerland, a country of 8 million where people typically rent, some 72,000 dwellings were empty in mid-2018 and that will rise by as many as 10,000 this June, according to consultancy Wueest Partner. With so much surplus, advertised rents could fall 1.5 percent, extending 2018’s 2.1 percent drop. “Price corrections in peripheral areas are almost unavoidable,” says Matthias Holzhey, head of Swiss real estate investments at UBS, who estimates a 10 percent drop. That’s potentially bad news for investors. 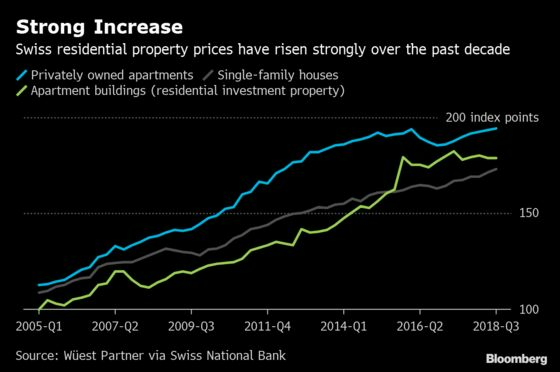 Since the SNB’s negative rate was introduced four years ago, insurer Swiss Life, the country’s biggest private property owner, boosted its real estate portfolios. “We’re concerned that there are risks lurking in the books of banks and pension funds,” said Roland Indergand, head of short-term analysis at the State Secretariat for Economic Affairs. The warnings haven’t translated into action by regulators. But countermeasures are challenging because traditional tools like loan-to-value curbs won’t apply for self-financed giant pension funds. And while the vacancy rate has been rising, it’s still low by international standards, and the post-crisis clean-up of the banking system means bigger buffers against shocks. Still, some lenders are playing it safe. Not everyone is convinced there’s trouble ahead. Roland Ledergerber, head of St. Galler Kantonalbank, doesn’t see a bubble in his region in the east of the country. “We simply don’t, to the same extent, share the fears of the SNB,’’ Ledergerber said.